BEIRUT, Lebanon (CNN) -- Lebanon's pro-Western bloc will retain its control of the country's government despite a strong challenge from a Hezbollah-dominated alliance, according to official election results released Monday. "March 14" coalition leader Saad Hariri claims victory after polls close Sunday. The "March 14" coalition won 71 seats in Lebanon's parliament, while the Hezbollah-dominated "March 8" alliance won the remaining 57 seats, Lebanese Interior Minister Ziad Baroud announced. Saad Hariri, the leader of the Sunni-dominated March 14 bloc, gave a victory speech Monday after the polls closed but hours before the official results were released. Turnout was high among Lebanon's 3 million registered voters during the 12 hours that polls were open Sunday. About 50,000 troops were on the streets, but the run-up to the balloting had been largely free of violence. There was widespread concern that the Hezbollah-dominated alliance would win control of the government, particularly with the support of Christian opposition leader Gen. Michel Aoun -- the only prominent Christian politician to back the March 8 bloc. Analysts feared that Hezbollah victory would have triggered heightened tensions in the Middle East, particularly with an estimated 30,000 rockets pointed at Israel from southern Lebanon -- all under the control of Hezbollah militants. Analysis: Do war clouds loom over Lebanon vote? Those concerns were shared by the United States, which dispatched two senior administration officials -- Secretary of State Hillary Clinton and Vice President Joe Biden -- to Beirut in the weeks ahead of the election. Hezbollah grew in popularity after its militant wing claimed victory over Israel after a 34-day military conflict in 2006. Since then, it has been more widely perceived by its supporters to be the "defenders" of Lebanon. Emboldened by that apparent victory, Hezbollah militants took to the streets last May in a show of force, seizing control of the streets of Beirut, marking the worst violence to hit Lebanon since the end of its civil war in 1991. The move was widely perceived as an embarrassment to Hariri's ruling coalition, which had to grant major political concessions to Hezbollah to restore order to Beirut. 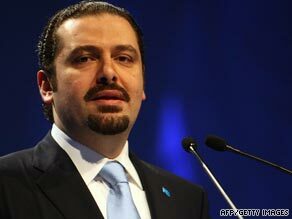 Despite Hariri's victory over the Hezbollah bloc, his coalition will still have to work with the Shia-dominated group. In Lebanon's unique power-sharing government, the presidency is reserved for Maronite Christians, the speaker of parliament is always a Shia Muslim, and the prime minister is a Sunni Muslim. The law was created to balance power among Lebanon's three main religious groups. Resident Georges Azzi, who cast his ballot early Sunday morning, hoped the elections bring about a smooth and healthy transition to a new government and the continued support of the West -- whatever the results. "I think it would be seen as a punishment to everybody if it doesn't," Azzi said. "We should accept the results whatever they are. That's how democracy works." The March 8 bloc is named after the date of a pro-Syrian mass demonstration in Beirut in 2005, called for by Hezbollah leader Hassan Nasrallah. Hariri's March 14 bloc takes its name from the day in 2005 when thousands gathered in Beirut one month after the assassination of Hariri's father, former Prime Minister Rafik Hariri, to demand an end to the Syrian occupation of Lebanon. Syrian forces withdrew from the country the following month. CNN's Cal Perry and Nada Husseini in Beirut contributed to this report.